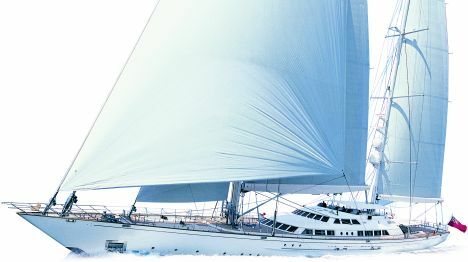 "Felicità West" is a 64-metre ketch produced by the Perini Navi shipyard with hull in aluminium and dedicated to demanding and fast cruises. 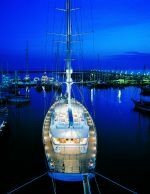 This is one of the biggest sailing yachts in aluminium with ketch rig ever constructed by this Viareggio shipyard, but this is not the only record that Perini Navi have achieved with such a production, in fact, the structural and design elements that make "Felicità West" a unique yacht are numerous. The design has been developed according to the needs of the owner, who intends to embark on highly demanding cruises with the family being able to count on a comfortable and welcoming boat in its interior, giving a high performance and a large open area. All of this has been designed by the Perini Engineering Design team, which has taken on the challenge to produce a sailing hull of 64 m entirely in aluminium in which it is possible to integrate all the requests of the future owner. Aboard the "Felicità West" everything has been conceived with great detail from the technical details to the purely aesthetic ones, thanks to which each setting is warm and elegant. The project has been developed on three and half decks, where the lower deck includes the owner's suite, occupying the entire width of the hull, fitted with small lounge, office corner, wardrobe, large bathroom and bath tub and separate toilet. 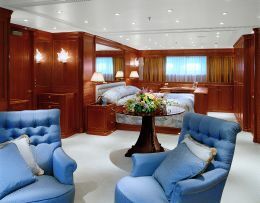 There are two guest staterooms towards the bow with double bed and private bathroom, another two guest staterooms with two beds and private bathroom. 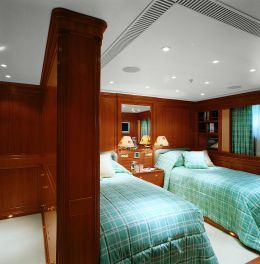 The bow end of the master section is dedicated to the crew, where we find the master's cabin with double bed, private bathroom and direct access to the bridge. 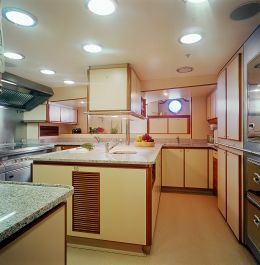 In front of this cabin is a large service area, which includes the galley, while bow side of this area are the dinette, and the crew's lounge. 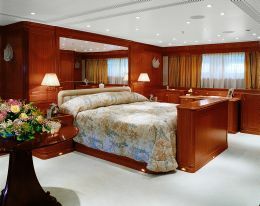 Proceeding on towards the bow we find another four cabins dedicated to the crew, all fitted with private bathroom and independent access to ensure the owner and his guests the right kind of privacy. 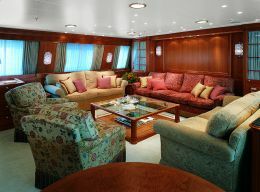 The main deck is characterised by the generous deck surface, where in the stern area there is an open air lounge fitted with two sofas with coffee table and ahead of this, under the upper deck extension stern is the relaxation area with three sofas and two tables. From this area you gain access to the lug, which bow side accommodates a large lounge with sofas, armchairs, table, round games table with four chairs, entertainment accessories and on the right side a lounge with sofa and table. 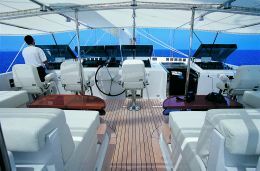 Ahead of this area, on a raised deck, is the bridge, fitted with all the instruments for manoeuvring and the electronics dedicated to the control and management of all the on board systems, in addition to the management of the important sail area. There is also a lounge with U shaped sofa and table in this area. 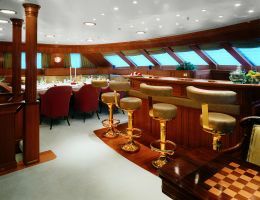 Always on the main deck and ahead of the control station, are the dining and bar areas. 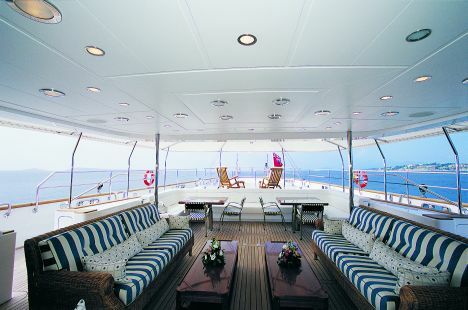 On the raised deck is a large relaxation area in the open air furnished with U shaped sofa with table and room dedicated to sunbathing, ahead of which is the control station in the open air on a higher level, where other sofas are present as well as all returns of the manoeuvring instruments. The deck surface houses the tenders positioned by keel and sided in the bow area. There are two RIBs of average dimensions, suited to transfer from and to the landing point and for excursions along the coast during stops. As regards the rig, which as we have said in the opening lines is ketch, it is composed of a mizzen-mast of 51 metres and a main-mast of 60 metres, which gives the wind a total surface area of 1,083 m2 of sail. The sailing features of "Felicità West" have been optimised by Ron Holland, a name tied to numerous projects of successful sailing boats and particularly boats known for their performance. The studies developed by Holland have allowed obtaining elevated performances in conditions of light wind and average and strong winds. Being a yacht conceived for Oceanic cruises, the electronic equipment and safety equipment are proportional to the power of the boat, from the USB radio station, to the various GPS cartographs, radar, Navtex, sonar, gyrocompass autopilot with three consoles, a wind station of B&G, Satcom B, three band telephone system and many other instruments to ensure contact with the mainland for the pleasure or talking to friends or relatives or for safety reasons. As we have said in the opening lines it is not simply a superyacht but a unique boat which more than being produced according to the needs of its owner appears to be produced on the dreams of all yachting enthusiasts.